Moerman enters an innovating stage. Polzn Bladz chips in. So, my alarm rang out on my iPhone at 5 AM mid week. It was not to take my self into the High Shine office in order to organise the work schedules and it was not for me to be on any site for any reason whatsoever. No – this was Window Cleaning Magazine work and I was about to rise, brush my teeth, shower and get ready for my journey to Northampton, UK. It had been snowing in the night across the UK and so the first thing I did was poke my head through the bathroom window to take a look out. The roads were silent and the sky was pitch black. Although very little snow covered the ground I bellowed clouds of smoke as I breathed out ward from the cold. It was freaking freezing! I packed the car with camera equipment and an overnight bag, got the car toasted by pre warming the engine and set off on the 58 minute journey to the house of Bob Hatt AKA Polzn Bladz. What this guy does not know about window cleaning hand tools of any brand, it is probably not worth knowing anyway. Originally inspired by Wagga’s YouTube Channel, Bob set up his own channel called Polzn Bladz back in March 2011. It now boasts well over 100 videos and over 140,000 views with a growing member subscription. There is only so much you can talk about squeegees, right? Wrong! Bob drills right down into why things work well and why some things don’t work just as well. Invariably, this has gotten him some unwanted flack, rightly or wrongly, by the odd manufacturer from time to time. Whereas one manufacturer may take offense and do nothing about the wealth of information stored in that inquisitive mind of Bob, some, after an initial offensive stance actually take a step back and digest the feedback, negative or otherwise. One such company did do this recently. And it was because of that connection I found myself in the early cold hours hitting the B6047 and A508 roads to Northampton. Moerman was the company. It started back in 1885 based in Meulebeke, Belgium. 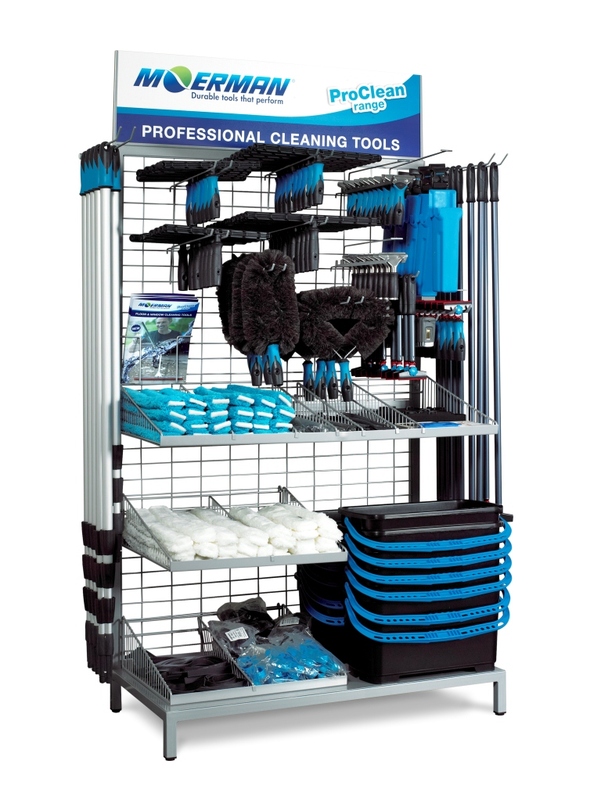 Their speciality was the manufacturer of brushes originally and today they are the market leaders in floor squeegees. Their longevity and strong hold in its market together with its bespoke plant equipment has helped to shape Moerman into a company at the top of its industry. Over the years the rubber it uses in its floor tools have been perfected as the best in the world. In its industry their competitors just cannot compete. So why then the connection between Polzn Bladz UK and a company like Moerman in Belgium? Over the years like many companies, different markets open up. This can take a company down an evolutionary route that brings them to where they are today. Sometimes this is out of necessity, sometimes it is out of spotting a new market. Moerman has experienced many changes in consumers over the decades and have adapted accordingly. One example would be the old shaving brushes that every man would have in every household. Moerman manufactured them until in World War 2, the US brought over cans of shaving foam. That market began to decline and as always you adapt to the new market. Moerman for many years had a very close relationship with Unger producing floor tools for them. For many decades they would produce for Unger some of which floor products you may be familiar with today. The story was to change when Unger moved its production to China. This left a big hole for Moerman, one they would start to fill very quickly. For the past 3 years Moerman has been gently simmering largely undetected by window cleaners. They had developed hand tools for professional window cleaners, a market they firmly have their sights on. At the beginning they set out to improve existing products and so they looked for the angles that would eventually separate them from the ‘me to’ tool production. Recently they have entered the world of innovation. Picture below: Guy and Bob talk on camera for WCM TV on how it all began. Guy Vande Vyvere, part owner of Moerman goes on to say, ” Its always the simplest of ideas that are the most amazing”. So, back to the trip to Northampton – I arrived at Bob’s house to meet his wife and children, we stopped for a quick cup of tea then hit the road. It has to be said we had the longest trip to Belgium ever!! The weekend before a lorry caught fire in the Channel Tunnel and this caused delays and complications right up to our road trip date. Prior to Dover we sat for over 2 hours in traffic only to wait another two hours or so waiting for the train. I think we counted 15 hours cooped up together before we got to Belgium including all aspects of our travel time. We got to know each other very well. 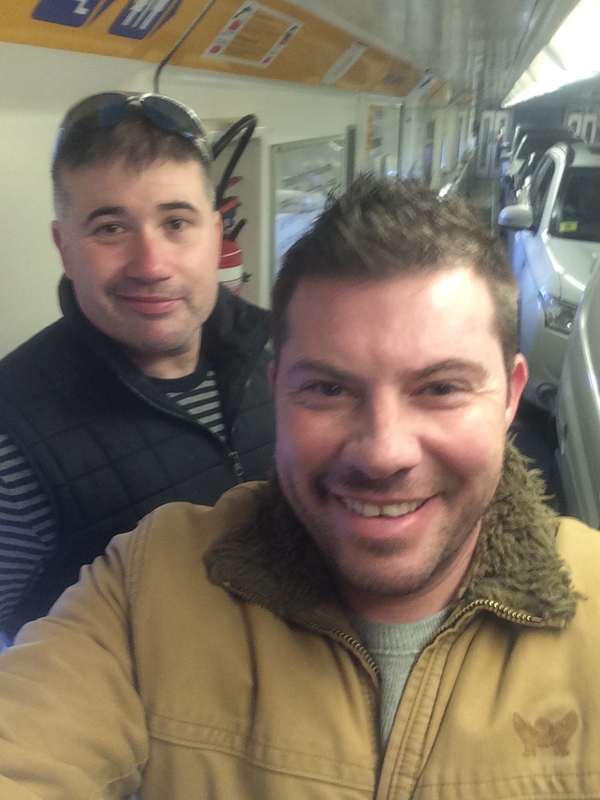 Picture below: Bob and Lee Burbidge of Window Cleaning Magazine passing through the Eurotunnel. Bob is a large set man who likes to push heavy weights religiously for an hour or so a day and he looks every bit the night club bouncer, but what I discovered was a very loveable, caring man with high moral standards and great love for his family. He is genuinely concerned for the people he interacts with and because of that he oozed endearing qualities. Bob speaks what he thinks and is honest in his opinions. He wears his heart on his sleeve and because of all this I could not help finding myself love this person for who he was. Bob and I quickly became friends and although the journey was long and tough, we laughed and joked in each others company. It was not until near midnight that we arrived at our hotel. It was a bitterly deep minus cold temperature, pitch black and to top everything off, checking in was closed!!!!!!! I actually thought we would have to spend the night in Bob’s van. Fortunately, Bob finally got contact with Guy who instructed us to look under a flower arrangement for an envelope with our room keys in them. We both laughed as we searched high and low for the envelope and we both commented on how we felt we were in the Crystal Maze program. Finally, we found the keys and we went to our rooms. I was sure that I would sleep for a week. Picture below: Guy and Bob discuss the soon to be released new product. The product is pixelated in this shot. The next morning Bob and I had breakfast to discuss the plan for the day. We were in Belgium to film footage for a new WCM TV film that documents the relationship between Bob and Moerman but more importantly the new hand tool that materialized from many meetings, conversations and prototype testing from their interactions. To date unfortunately we cannot discuss the details of the tool but only to say, that this simple idea will save you time and money. Although the release date is TBA my guess would be a launch around February/March time of 2015. This will be a new turning point for Moerman with many new ideas in the pipeline. If they are as exciting as I think this new product is then the industry will see a new player edge themselves slowly onto the industry map. 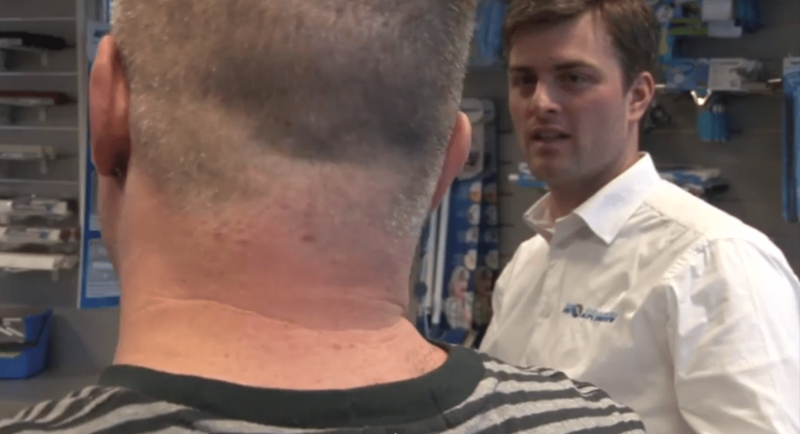 I first met Guy Vande Vyvere ( Part owner of Moerman) about two years ago when we filmed his stand at the NEC Cleaning Show in a segment we like to call Booth Talk. Guy is a family man, very likable and understanding. The friendship that has developed between Bob and Guy is obvious to see. My guess is that Guy has latched into the same warming qualities I described earlier about Bob and they bear hug like long lost friends. Its really lovely to see. Guy is driven and knows where he wants Moerman to be in the market. When it comes to family time he is 100% but in his own words, “I rarely switch off from Moerman business and am nearly ‘on the clock’ all the time. Albeit sometimes in the background at home with the family (laughs)”. In business he is completely focused on success. He does his homework and he listens intensely as he digests data. Having studied in the US, his engineering background shines through as he works out problem solving solutions to reach the most efficient goal keeping in with quality, cost and safety and ease of use are the pillars of their current thinking. To me I can see that the coalition of ideas for Moermans new range of future products enlisting people like Bob Hatt, other local window cleaners in Belgium and fusing this with Guy’s Moerman team will actually start to turn a corner for this company in its new direction into innovative pro window cleaning tools.